Not sleeping, not so beautiful. 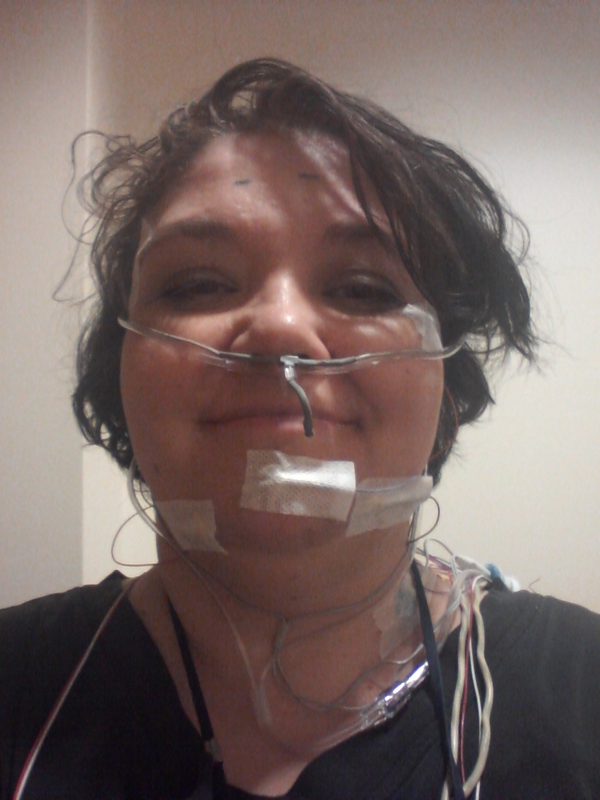 The long-awaited sleep study took place last week, at Providence Milwaukie Hospital’s Sleep Lab (and I am just now writing about it because I am the Queen of Procrastination!). It’s always fun, going to a strange place at night, being told to put your pyjamas on, watch a video, and then get a bunch of wires attached to your body. I’d recommend it to everyone looking for a groovy night out. I was pretty sure I’d have trouble sleeping while wired up, since I have issues sleeping in my own bed, with my own stuff touching me. How was sleeping with wires taped to my calves and head, strapped to my chest & waist, and (worst of all) a little prong-thingy in my nose going to be possible?! Not only did the wires totally f#*k up my hair, the one on my chin itched, and the ones in my nose were frigging’ ANNOYING! Oddly enough, I was able to sleep. Which probably shouldn’t surprise me, since my life is just that weird. I didn’t sleep WELL, but I did sleep. The next morning, it was confirmed that I do not have sleep apnea (which I was pretty sure I didn’t anyway), but that I’d never gone into REM sleep, and that my RLS had been active all night. I’m not sure yet what these things mean, since I’ve not spoken to the doctor about this, yet, but that no-REM-sleep-thing can’t be good, can it? On another note, I did see the doctor about my sore ankle and bad ear. A visit to Dr. Jeff, with his pointy shoes and metrosexual style, is always a pleasure, and not just because he’s a snazzy dresser. He’s a good doctor, pays attention to what I’m saying, and takes care of things right away. This time, he sent me to physical therapy to work on getting my ankle fixed, and gave me ear drops for the infection I didn’t even know I had. I’ve had trouble with my left ear for the last year, ever since I got water in it, and over the last month it had hurt off and on. Now, I’m putting in ear drops four times a day, and with luck, will feel better soon. Big fun. It’s been a rough week. I went to see a new primary care doctor just over a week ago, and really liked him. He addressed the issues that the doctor I was leaving refused to look at– insomnia & RLS– and was nice on the eyes. Plus, he did not once tell me I’d sleep better if I got more exercise, or tell me I need to lose weight. He gave me some new meds, and increased the dosage on my RLS med. I was happy. The problems began the next day. I wasn’t sure if I’d picked up a stomach bug, or if I was having a reaction to on of the meds, but I felt horrible. Stomach cramps, pain, the whole nine yards. By Thursday, I was begging my sister to kill me, but she refused, damn her. Over the weekend, I went back to the lower dose of the RLS meds, and suddenly *** angels singing *** I was better! Last night, I took the higher dose, and this morning, I’m dying again. UGH. So, I’ve now spent all this time being absolutely miserable for no reason whatsoever. Could have fixed it at any time. 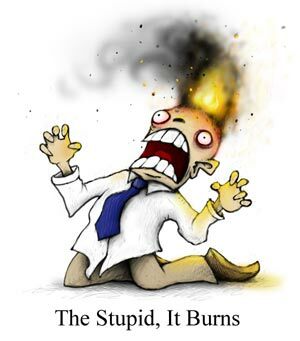 Not only am I in pain, but I’m too stupid to figure out why. I really should be in bed. Instead I’m sitting in the living room, watching ‘The Late Late Show with Craig Ferguson’ and writing. I haven’t been sleeping well lately. So, I apologize if I begin to ramble. Sleep deprivation will do that to you! 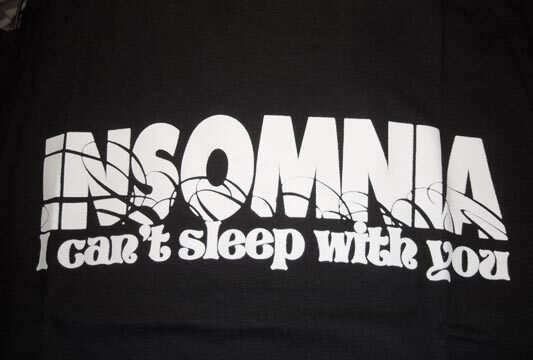 Insomnia isn’t a new thing for me–it started way back at the dawn of time, when I was in high school. Always the same pattern. I fall asleep easily enough, and sleep well for a few hours. Then, usually about 2:30 a.m., I wake up, needing to pee, and after that, I’m awake for hours. Sometimes I’ll be able to fall back asleep for an hour or two, but my twitchy feet usually watch me back up. I’ve tried all sorts of insomnia remedies: medication, bedtime yoga, Sleepytime tea, self-hypnosis, melatonin & Valerian, and a white noise machine. Not many have been successful for long. I’ve heard all the advice, and have tried most of it, to little avail. I simply don’t sleep. I’ve also tried many many remedies for RLS, most of them home remedies found online. So far none have worked for long. I’ve taken magnesium citrate before bed; I’ve rubbed my legs & lower back down with apple cider vinegar; I’ve done a series of strange exercises in the dark. The thing that worked the best was eliminating caffeine & sugar from my diet, which I did to get rid of migraines. Discovered it helped the feet. Of course, now I’m back on the coffee wagon, (or did I fall off the wagon? ), so I may have to fix that… I do know there are a couple of medications available for RLS, but so far, I haven’t tried them. Didn’t want to add one more med to my already large collection. If things don’t improve, I may change my mind. There was a time when I’d get out of bed and clean my apartment in the middle of the night, but those days are gone. (We have neighbors here who are very sensitive to noise, and even running water after ten seems to annoy them, so no more scrubbing the bathroom or rearranging kitchen cabinets!) Some nights I turn on my bedside lamp, pick up my book and read; other night I get online and discover strange new blogs. Most nights I simply lie in the dark, listening to the fake ocean sounds from the white noise machine, trying to count backward from one hundred, as I take deep, even breaths, and hope I’ll relax enough to to fall asleep again. Tonight I’m going to finish watching Craig Ferguson, then stay up as late as I can, in hopes that I can reset my inner alarm clock a little, or at least throw it off balance. And then, with any luck, I’ll get some sleep, dammit!